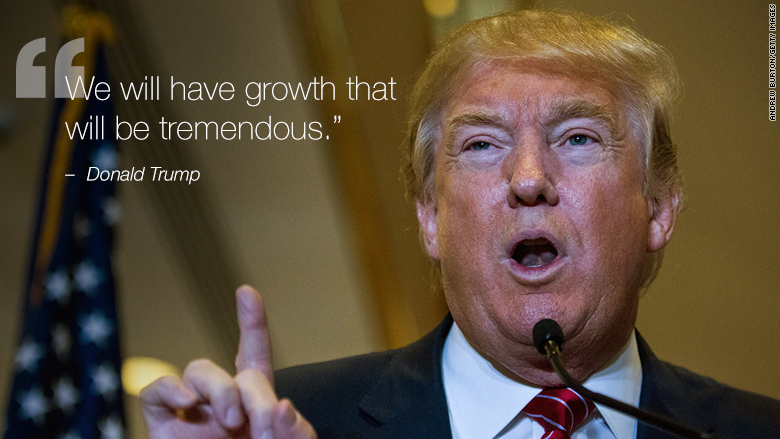 Businessman Donald Trump vows America will have "tremendous" economic growth if he's elected president. "The economy is what I do well," Trump said Monday as he unveiled his plan to overhaul the tax code. So far, Trump's promises to grow the U.S. economy by 3% sound fairly conservative, at least compared to Republican rival Jeb Bush's. Bush is shooting for 4% growth -- nearly double what it is now. Experts say: Trump's goal is a lot more reasonable, but his plan to get there is still pretty thin. "Three percent is very realistic," says Allen Sinai, chief economist at Decision Economics. 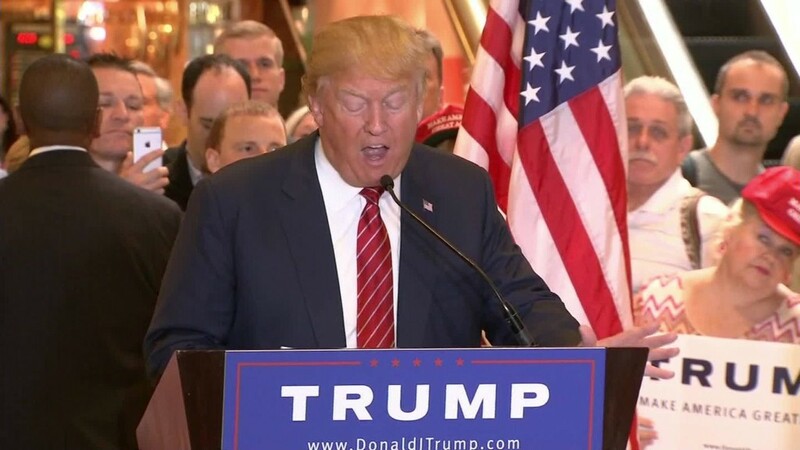 "Candidate Trump has picked an easy target. Very clever." History is on Trump's side. The U.S. economy has expanded at 3% a year, on average, since the end of the Great Depression. Bush's goal may be achievable for a short period of time, but most economists don't think it's sustainable. In fact, some experts caution that even getting America back to 3% growth will be a miracle (last year GDP was 2.4%). There are real doubts that either Republican's plan could hypercharge the economy enough. "A candidate with a number is not a candidate with a plan. What's the plan?" asks economist Robert Brusca of FAO Economics. He says the usual GOP plan to get rid of government regulations is "oversold" as a solution. The U.S. faces a big problem going forward: an aging population. As Baby Boomers retire, there will be fewer workers. That means growth will depend heavily on America's ability to increase productivity through technological innovation. "Mainstream economists put longer-term growth potential closer to 2% than 3%" because of the aging population, says Robert Denk, senior economist at the National Association of Home Builders. There needs to be something dramatic to lift that forecast. Both Bush and Trump say the magic sauce for pumping up growth is tax reform. They argue that lower taxes for individuals and businesses will spur investment and growth. Bush has also vowed to scale back government regulations such as repealing the Dodd-Frank financial reform law and the net neutrality rule. "The U.S. ranks 46th in the world in terms of ease of starting a business. That is unacceptable," he wrote in an Op-Ed in the Wall Street Journal. The non-partisan Tax Foundation has analyzed both candidates' tax plans. It finds that Trump's plan would grow the economy slightly more than Bush's and create more jobs. However, Trump would likely fall short of his 3% GDP goal from this alone, and it would leave the government even more in debt, which could be a drag on growth. Bush would leave a $1.6 trillion gap, according to the Tax Foundation while Trump's proposal would end up with a $10.1 trillion hole. That means the U.S. will have to either slash spending or increase the debt. "There is so much waste in government that I believe when I get in there I'll be able to cut, without losing anything," argues Trump. He's even gone as far as to suggest that such cuts could boost growth by 5% or more. When it comes to Trump's plan, "it isn't clear the substance meets the rhetoric," says Maya MacGuineas, head of the Campaign to Fix the Debt. Her team hasn't heard anything realistic yet to suggest that Trump won't add to the debt. That's not helpful to the economy over the long term. Economists also question how much Trump's push to deport 11 million undocumented immigrants would cost and whether it would be harmful to the economy. On top of that, Trump has proposed rolling back major free trade agreements such as NAFTA. In a worst-case scenario, that's calling for war with nations like Mexico and China, which would be a drag on growth. Despite the red flags about his economic plans, Trump still gets the highest ratings when Republican voters are asked who they think can "best handle the economy." The economy was supposed to be a strong issue for Bush to lead on, especially since Florida flourished under his tenure as governor, which ended before the 2008 financial crisis. But in the latest CNN/ORC poll, Trump gets a 44% approval rating on the economy and Bush only gets an 8% rating, behind Carly Fiorina and Marco Rubio.